Lexicographers know from historical example and the nature of the job that they’re in for a long haul. Samuel Johnson thought his dictionary project would take three years, but even with the help of his various amanuenses it needed nine. James Murray worked on what was then called the New English Dictionary on Historical Principles for 36 years, his labours being terminated only by death. 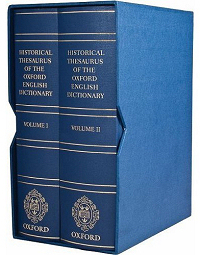 Development of the Historical Thesaurus began in 1967. Its current director, Christian Kay, and another editor, Irené Wotherspoon, both joined as research assistants two years later and so each has completed 40 years of unending slog. The grand plan was to create a unique work of scholarship and that is what it is — there’s nothing like it in any other language. Most thesauruses basically take a snapshot of the language as it is when it is compiled (lexicographers call this a synchronic view). Its editors will include literary or archaic terms and colloquial or slang expressions that may one day become part of the standard language, but essentially they’re cataloguing a slice across one moment in time. The Historical Thesaurus takes the other possible stance: recording the words English has used for concepts across the whole history of the language — a diachronic view. Take money for example (a word much in our minds at the moment). The entry fills a column and tells us that the earliest word for the concept — in Old English — was mynet, with money itself turning up around the year 1290; a glance down the chronological list throws up gelt (first recorded around 1529), lour (in use from 1567 on), mint-sauce (from 1812), and a host of others from the past two centuries that we may recognise from our reading even if we don’t use them ourselves: oof, lettuce, ackers, bread, spondulicks, moolah, lolly, loot, and dosh. All these are tagged with the date of their first known appearance and — if it has — when it went out of use again. This is treasure-trove, which careful writers can mine for nuggets of vocabulary. There’s no excuse any more for anachronisms. If you’re creating an historical novel or film or adapting a classic for television, you can check in this monumental agglomeration if — for example — your character might have called money dough in 1800 (no, because it’s first recorded in 1851) or what might have been a suitable slang term for it in 1700 (spankers, cole and rhino are all possibilities). The source of this knowledge, as the title shows, is the Oxford English Dictionary. The compilers of the Historical Thesaurus took every word in the OED and placed it within a framework of meaning that they constructed, a monumental task that makes one’s mind reel, as does the thought of creating the framework itself. Most thesauruses today use the classification scheme invented by Peter Roget in 1852, but the compilers of the Historical Thesaurus realised that this wouldn’t be comprehensive enough and generated their own. All knowledge is divided into three broad families: the external world, the mental world, and the social world, numbered from 01 to 03. These families are progressively subdivided into more and more detailed classes. The class 03.10 is work, 03.10.13 is commerce and trade and 03.10.13.15 is money. The grading goes deeper — 03.10.13.15.05 is currency, 03.10.13.15.05.01 is coins and 03.10.13.15.05.01.05 is foreign coins. This last entry has hundreds of historical terms organised by country, such as the Dutch stiver and the American sharpshin. To look up the index (the second, larger, volume of the two-volume work), is to experience a mass of numbers dancing before the eyes like every lottery draw of all time rolled into one. It’s an extraordinary work. The pity is that it’s so expensive that only libraries, big institutions and a few well-heeled individuals can afford it. I’m told that a digital edition is to be made available in conjunction with the online Oxford English Dictionary but that no publication date has yet been set.